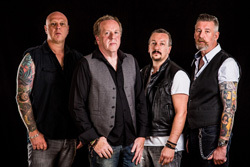 Culling their name from an infamous 1920's speedway racing group, In Faith singer Pete Godfrey and Angels or Kings bassist Rob Naylor have created a new band, Blood Red Saints. The band is rounded out by Pete Newdeck (Tainted Nation, In Faith) on drums and Lee Revill (Gary Hughes) on guitar. They arrive with their firs album, Speedway. And what you have, essentially, is some rather terrific classic melodic hard rock. It's got a bit of an metal edge thanks to the sharp guitars, but all things are wrapped up in and abundance of melody and harmony, groove, and plain AOR accessibility, of the arena rock variety. Regarding the guitar work, it's one of the striking elements of the album Naylor is a master of melody and harmony, while delivering brisk riffs and ripping guitar solos. Godfrey continues with has powerful, passionate, and always melodic vocals, which in turn are backed up by Pete Newdeck. Notable are Wrapped Up In These Arms, Best Of Me, and Feels A Lot Like Love. However, sometimes, especially in the stronger songs, they seem to take a back seat to the music. This likely comes from the mastering, which is surprising. It was done by Harem Scarem's Harry Hess, himself a vocalist. But I've noticed the same on other projects he's had his hand in. Nevertheless, it doesn't deter from the overall character and quality of this album. It's a rare thing. There's not bad song here and no filler. The ones that turned my head and charmed my ears where those that bound great vocal harmonies with catchy groove. Namely, Love Set Me Up Again, the warm Faith, Best Of Me, and the aforementioned Wrapped Up In These Arms and Feels A Lot Like Love, all arena worthy or radio ready rockers. Bottom line: Speedway is fine metal-edged AOR melodic hard rock from Blood Red Saints and, hopefully, the beginning of more to come. Easily recommended. 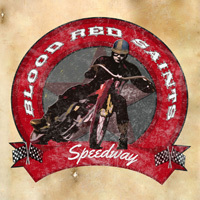 Speedway is fine metal-edged AOR melodic hard rock from Blood Red Saints and, hopefully, the beginning of more to come. Easily recommended.